Whether your dream is to pilot an aircraft or help guide it through stormy skies, Academy College offers the career training for you. Our graduates secure exciting jobs such as: aircraft dispatcher, airline pilot, corporate pilot, air charter pilot, fire watch pilot, test pilot, fixed-base operations manager, airline manager, customer service representative, aircraft sales, aircraft insurance, airport security and airport management. Academy College students complete their flight training at Thunderbird Aviation, the Twin Cities’ largest flight training program, with two locations in both the north and south metro areas, respectively. For more about Thunderbird, which has been a fixture in the Twin Cities since 1962, go to www.thunderbirdaviation.com. 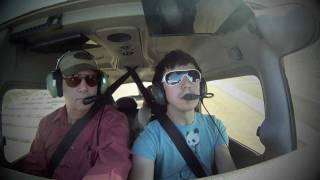 Watch an Introductory Flight Lesson at Thunderbird Aviation. Luke Hayes, an Academy College student, flies with his wife and his flight instructor, Fred Nauer, at Thunderbird Aviation. Over the next two decades, 87 new pilots will need to be trained and ready to fly a commercial airliner every day in order to meet our insatiable demand to travel by air. That’s one every 15 minutes. Retirements at U.S. airlines will start to rise precipitously starting in 2021 as the current crop of pilots turns 65, the mandated age of retirement. More than 42% of active U.S. airline pilots at the biggest carriers will retire over the next 10 years, about 22,000. Passenger and cargo airlines around the world are expected to buy 41,000 new airliners between 2017 and 2036. And they will need 637,000 new pilots to fly them, according to a forecast from Boeing released this week. That staggering figure is matched only by how many will leave the profession in the next decade — particularly in the U.S.
Commercial pilots on major carriers today are usually required to have bachelor degrees, and Academy College has a bachelor degree program that combines practical flight training with a broad set of courses in Aviation. Many college programs have students take quite a few courses before they ever get into a plane, but at Academy, it is possible to fly the first week that classes begin. Moreover, at Academy College students schedule their flights at times of their own choosing, as long as the hours comply with FAA regulations on day and night flying. As if that is not enough, you may very well receive your first paycheck as an aviator while still a student at Academy College. Academy partners with Thunderbird Aviation (www.thunderbirdaviation.com), and thus after you are certified as a flight instructor at the instrument level, you are ready to interview for a flight instructor position with Thunderbird. As our Chief Flight Instructor, Frederick Nauer, likes to say, “Your entire career at Academy is an interview for a job with Thunderbird Aviation. Fred should know, as he hires and supervises all of the flight instructors! Perhaps the most attractive feature of our Commercial Pilot program at Academy College is that as a Part 141 degree-granting institution, we are able to reduce hours from the FAA mandated 1500 flight hours needed to become a commercial pilot. If you complete our courses in the prescribed order, a bachelor’s degree would allow you to apply for a pilot position with only 1000 hours of flight time. 500 hours are a lot of time that you can be working as a commercial pilot rather than a flight instructor. Once you reach that 1000 hour point, you will be able to leverage Academy College bridge agreements with several regional airlines. These agreements can get you interviews and internship opportunities that will start your career off the right way. We are at the crest of a big wave in the airline industry, and the time to act is now. For more on the admissions process and requirements, see https://www.academycollege.edu/admissions/. 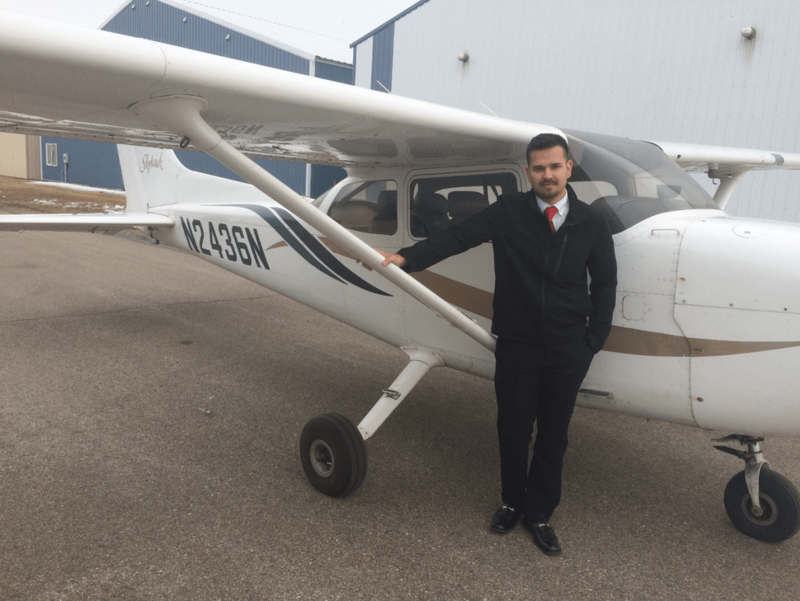 Israel Persaud, a student at Academy College, by finishing his certified flight instructor instrument check ride has completed all the requirements for graduation from the Academy. Congratulations, Israel! To experience the nostalgia of flying, check out Thunderbird Aviation’s Introductory Flights that allow you to fly the plane under close supervision for just $99! Academy College partners with Thunderbird Aviation, the Twin Cities’ premier flight center. If you are interested in an introductory flight where the YOU will fly the plane under close supervision, or you would like to schedule a scenic flight and fly over Lake Minnetonka, call 951-941-1212.